Family Picture | What Next? I am working on a history book about Dave’s parents for an upcoming family reunion. Dave’s cousin John who is the true Driedger family historian has been helping me by providing some wonderful photographs. My very favorite is this one of Dave’s Oma Margaretha Friesen, posing with her siblings and cousins in the village of Schoenfeld where they all lived. Dave’s Oma is standing against the tree with a balalaika in her hand. 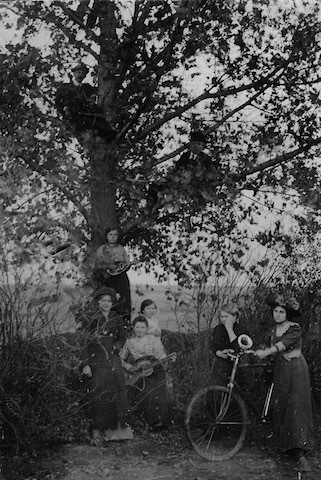 One cousin with a very fashionable hat is riding bike and Margaretha’s brother Cornelius and another man are up in the tree. I think the photo reflects what I heard so often from my own grandparents about how almost idyllic and prosperous a life the Mennonites had in Ukraine before the revolution. There was time for leisure pursuits, farming was financially rewarding, Mennonites ran profitable businesses and established good schools and enjoyed music and other cultural endeavors. And then within a decade everything had changed and this whole way of life was gone. I think this photo was probably taken around 1913. It is a reminder that a seemingly stable and good way of life can disappear dramatically.